Caskets are used for services which will include visitation or viewing, a funeral ritual and then ending with a cremation. They are aesthetically pleasing and designed for family and/or public gatherings. Designed with materials more durable than those used in cremation containers. Usually have a fabric interior available in many designs and colors, and are used when there is to be a viewing. Designed to provide a dignified setting when the body is to be present at the services. Usually constructed of combustible materials, fashioned and finished with water-based glues and finishes, which during the cremation process do not release harmful emissions. 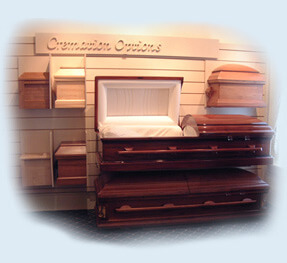 Cremation containers are used with the most basic of service ending in cremation. Designed for cremation and made from materials of less permanence and therefore are less expensive. Designed for the safe transportation and /or proper storage of the deceased while providing protection for those who handle the container. Designed to provide a dignified setting for identification purposes. Usually constructed of combustible materials, fashioned and furnished with water-based glues and finishes, which during the cremation process do not release harmful emissions.